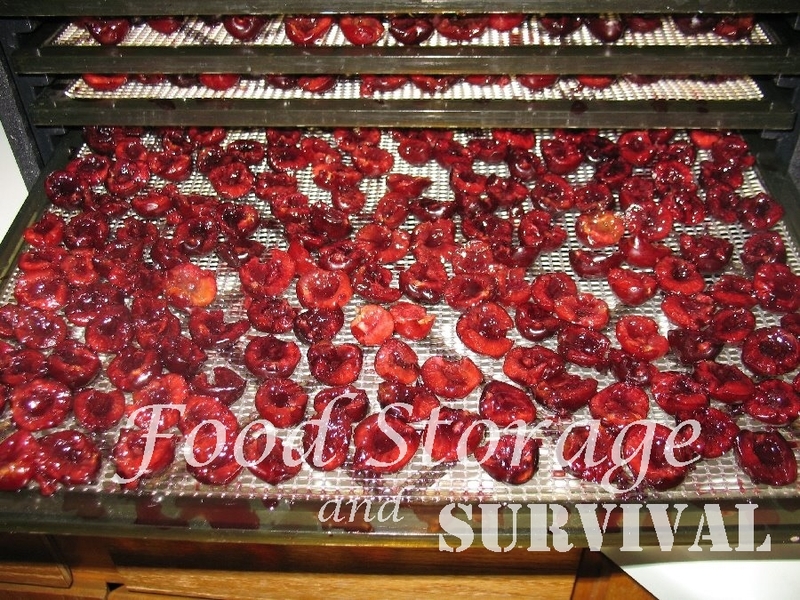 Dehydrating Cherries is pretty easy, but does require that you have a cherry stoner unless you really want to cut the pits out of every cherry (NOT recommended unless you really have nothing better to do with your time, which I can’t imagine). Step one is to wash the cherries. Yep, that’s the same wash the cherries picture from the canning cherries post. Next you’ll run the cherries through the handy dandy cherry stoner–mine is made by Back to Basics and clamps to the counter edge. 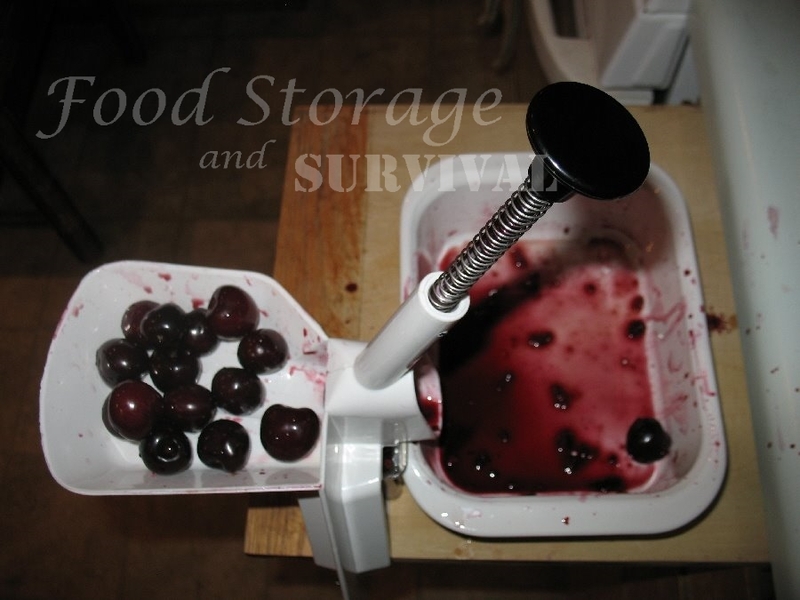 The cherries go in one side, then you push the plunger and it pushes the pit out into a little container and the pitless cherry falls out the other side. It gets hung up every once in a while, but most of the time works pretty slick. 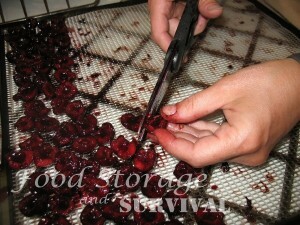 Next, cut your cherries in half and put them on your dehydrator trays so the cut side is up. This preserves the juice in the cherry as it dries. Once the trays are full of little cherry halves, start the dehydrator. 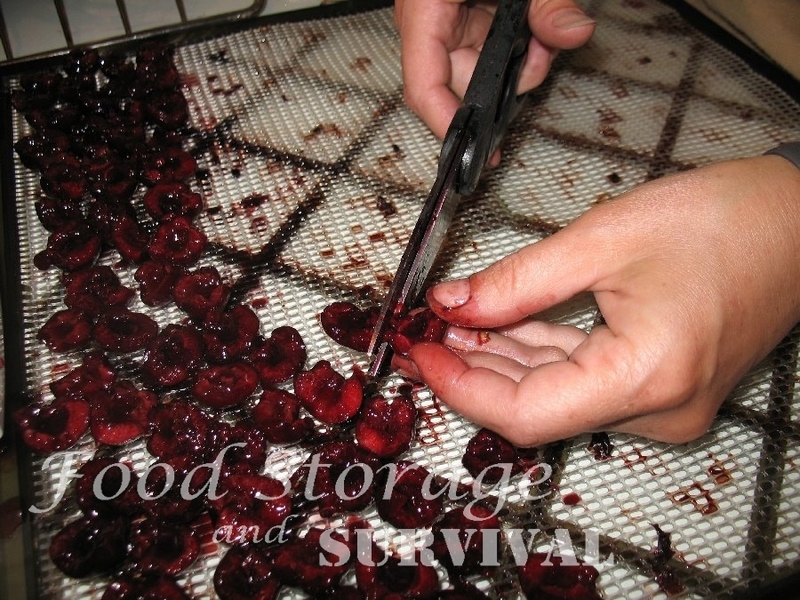 Depending on how large your cherries are and how humid your climate is, it takes from 13-20 hours to dry cherries. Dry them until they’re like old raisins. Still sticky, pliable, not crispy, but not meaty. It took 2 1/2 trays of cherries to fill a quart jar. Dehydrating is like that. 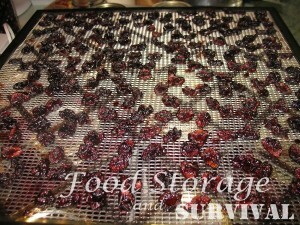 You do a lot of work and it ends up taking up very little space, which is good for storing lots of food, but not so good when you look at it and say, “I did all that work and that’s all I have to show for it?” I was going to do some fruit leather with the cherries also, but the dehydrator was busy drying plain ol’ cherries, so I froze a bunch to work with later. I love to eat dehydrated cherries straight or put them in homemade granola type cereal. They are more tart than eating the cherry raw. They could go anywhere you would normally put a raisin, so cookies are fair game also. Yummy! Wow! I LOVE that cherry pitter. We just picked 10 lbs of small sour cherries and it took 5 hours to pit them all by hand. Thanks so much for providing such fine and lucid descriptions on your website! That looks good but it sure looks like a lot of work, too. That cherry pitter is awesome! I think I need one of those things! Great blog! I know what you mean about all the work and not much to show for it. 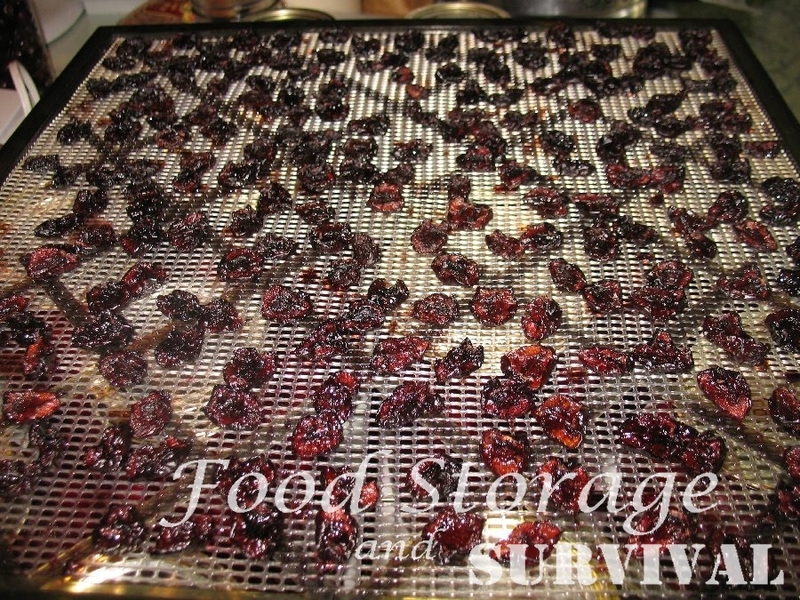 I just got my dehydrator and did a batch of tomatoes… it filled a small sandwich bag… I have 6 gallons of figs coming today so I am going to try some honey dipped figs and see how they turn out. Would love to be able to dehydrate more. My little dehydrator just doesn’t have much room. 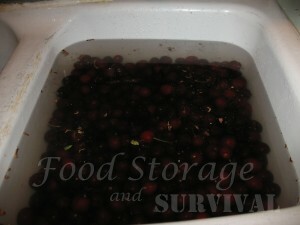 We love dehydration for our fruits to make trail mix and to make jerky for hiking.